Water Action Day brought together legislators, like Senator John Marty (second to left) and advocates, including (to Marty's right) Honor the Earth's Lorna Hanes, MN350's Sarah Hollander, FMR River Guardian Sarah Aplund and clean water rally headliner Winona LaDuke. Roughly 750 people joined us at the Capitol to urge legislators and Gov. Mark Dayton to invest in clean water and protect Minnesota's great outdoors. Water Action Day began with hundreds of advocates pouring in from across the state, including many who took buses from Greater Minnesota. After coffee and treats we dived into educational workshops and training sessions offered by the Water Action Day team. FMR board member Marcia Avner lead three Lobbying 101 briefings on how to actively engage legislators, followed by sessions about important water issues and policy decisions facing Minnesota. Attendees also enjoyed a complimentary screening of the Bell Museum of Natural History’s film Troubled Waters, followed by a discussion with film producer Barbara Coffin. Many participants also stopped by our “Wisdom Table” to meet with policy experts, and sampled water from our friends at the Water Bar before heading off to meet with their legislators to share our clean water message. Following a complimentary lunch, Water Action Day participants gathered outside the Capitol for a pre-rally clean water ceremony lead by our tribal partners. Meanwhile, a group of 75 youth attendees participated in a special youth caucus with representatives from Gov. Mark Dayton's administration. 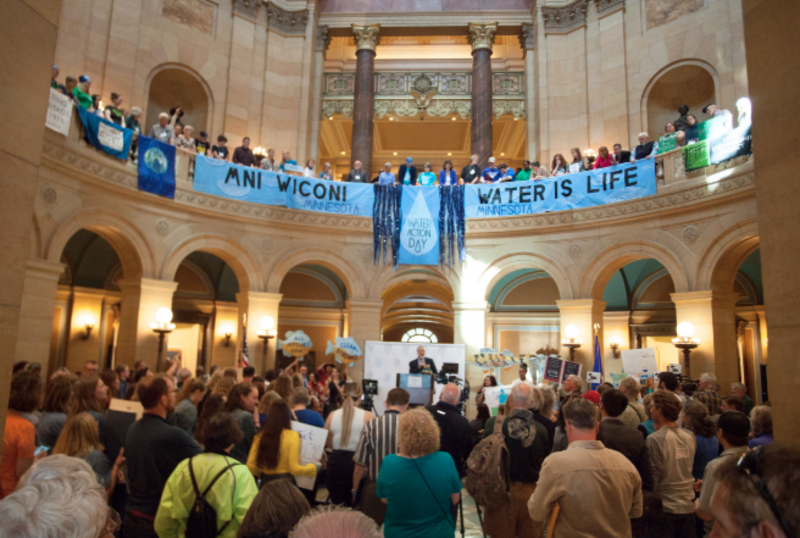 Shortly after, about 700 people gathered in the Capitol rotunda for a diverse and energetic clean water rally. Emceed by the Izaak Walton League’s Don Arnosti, the rally was headlined by Winona LaDuke. Other speakers included for U.S. Senator Dave Durenberger, farmer Darrel Mosel, youth representative Annabelle and farmer Audrey Arner. While Gov. Mark Dayton was too ill to join us, his staff did attend and shared the governor’s official proclamation of May 2, 2018 as Water Action Day in Minnesota! We were particularly heartened to see hand-made signs from rally participants representing residents from across rural Minnesota – proving that Water Action Day truly represented all Minnesotans. We were able to make appointments with 144 legislators to discuss protecting clean water during the day. While most House appointments went smoothly, the Senate was in session for part of the day, requiring coalition staff to request senators' step outside the chamber to meet their constituents - which many did despite a busy legislative day. Following their meetings and clean water rally, many participants returned to home base at Christ Lutheran Church across the street from the Capitol to write thank-you notes to their legislators, submit letters to the editor in their local paper, and visit our social media station before heading home for the day. Water Action Day was made possible by the event’s 38 partners and sponsors. Sponsors helped fund the event and assist with organization and promotion. 2018 Sponsors included: Audubon Minnesota, Clean Water Action, Duluth for Clean Water, EMA Inc., Friends of Pool 2, Friends of the Boundary Waters Wilderness, Friends of the Mississippi River, Izaak Walton League, Land Stewardship Project, League of Women Voters, Minneapolis Rowing Club, Minnesota Center for Environmental Advocacy, Minnesota Environmental Partnership, MN350, The Minnesota River Congress, ONE BluWorld, Pollinator Friendly Alliance, Save Our Sky Blue Waters, Sierra Club North Star Chapter, St. Croix River Association, Trout Unlimited, WaterLegacy and the Women's Congress for Future Generations. Event partners helped promote the event assist with coordination and organizing! 2018 Water Action Day partners included the Campaign to Save the Boundary Waters, Coalition for a Clean Minnesota River, Conservation Minnesota, CURE (Clean Up the River Environment), Environment Minnesota, Honor the Earth, Minnesota River Congress, Native Lives Matter Coalition, The Nature Conservancy, New Ulm Area Sport Fishermen, Pesticide Action Network, Save the Boundary Waters, Take Action MN, Wilderness in the City and Women's March MN. Water Action Day 2018 was a resounding success, in part because Minnesotans from all walks of life and every corner of the state came together to speak with one voice for protecting our water. Thank you to everyone who participated. Together, we will continue to stand up for clean water for all Minnesotans. Many of FMR's victories are thanks to our strong base of advocates. Sign up to become a River Guardian, and we'll email you about events like Water action Day and when an important river issue arises. We make it quick and easy to contact decision makers. River Guardians are also invited to smaller special events, including happy hours, about important legislative and metro river corridor issues.